The vision: to address issues in climate change, sustainable urban development, and water security. The proposal: a mixed-use development dubbed the FrenchDreamTowers, a futuristic high rise project utilising energy-efficient micro-algae exteriors and blockchain-monitored building systems. The project is focused on meetings the needs of smart cities in the future and is supported by a Chinese commitment to increase spending on renewable energy to $500 billion by 2020. The four proposed towers will comprise panoramic bars, “haute-cuisine” fusion restaurants, hotels, spas, fashion shops, tech hubs, co-working spaces, start-up incubators, art galleries and artists’ residences. The innovative green blockchain support-network created by Hangzhou-based Gold Truffle Engineering will manage air quality, energy storage and the multitude of environmental systems interacting within the towers. “Our platform is an IoT/AI/cloud infrastructure platform with sensors,” says co-founder of Gold Truffle Engineering Fadwa Sube. The self-learning systems will aim to make the tower efficient, while working towards preserving energy. “We are tools for a decision maker,” Sube explains. The studio’s design for FrenchDreamTowers includes its patent-pending “bio facade” technology. The facade, which will produce oxygen and absorb carbon dioxide, also uses thermal materials to regulate the growing temperature of algae, which in turn contributes to the thermal regulation of the building providing a much better insulation. 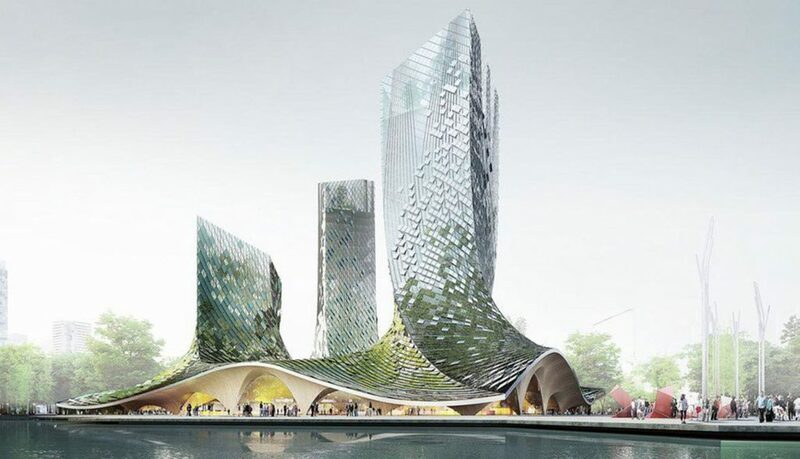 The algae will also enable the harvesting of rainwater with the help of the natural shape of the facades strategically directing water towards basins on the roof and ground. Aquaponics systems embedded in the towers will allow for the cultivation of vegetables, flowers and fish. The vision for the FrenchDreamTowers comes as a result of French-Chinese relations as both nations continue to share cooperative environmental goals. For now, the architectural and technological venture remain “under review”.